Plans to build a 5,000 home "eco town" in Lincolnshire have been scrapped at a council vote. The plan, for a town in Manby or Strubby near Louth, had already made a government shortlist of developments described as carbon neutral. East Lindsey District Council voted to withdraw the plans at a meeting after protests from residents. But Ian Bustin, communications officer at the council, said 5,000 new homes still needed to be built in the area. 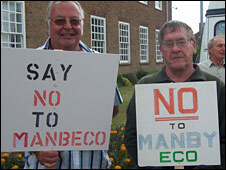 "A decision was made by the council not to proceed with the eco-town but to adopt an alternative proposal," he said. "What that will allow us to do is go forward and address quite serious issues of accommodation, housing investment and coastal defence". Opponents of the plan said they were elated at the decision and glad the council had listened to the public. One protester, Derek Turner, said: "We were delighted and also relieved. "From our point of view it was a triumph for common sense and for local democracy." The council has asked residents to put forward alternative sites for the homes.